On 30th January the College hosted teachers and other education professionals from around the County as they attended a full day of presentations and discussions about recognising Dyslexia in the classroom and the uses of technology software and hardware for helping identified students. 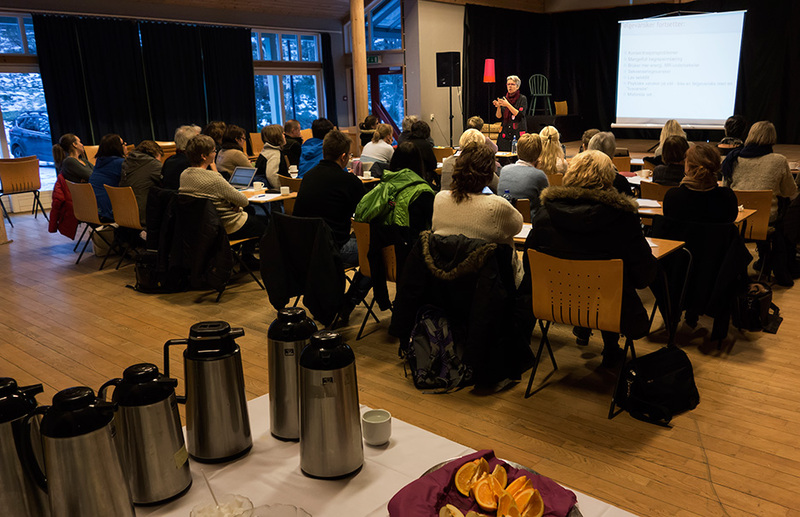 Presentations were given by Åsne Midtbø Aas and Lillian Dale – two very experienced professionals. Staff from the College also attended and were pleased with the way the day had gone. The new year brought us four new RCN community members: Nimra (Pakistan), Gautham (India) and Festina (Kosovo). 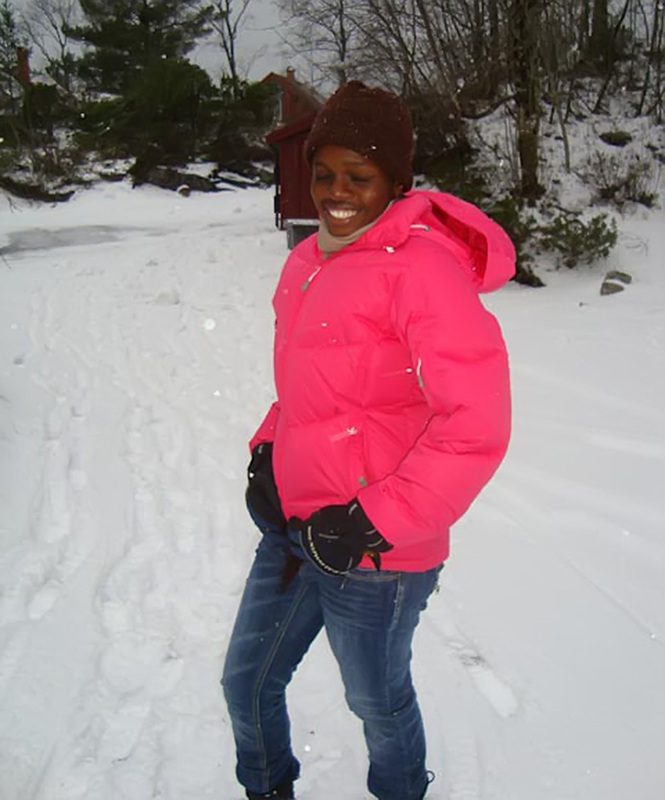 The last arrival, in late January, was Desiree (Congo). 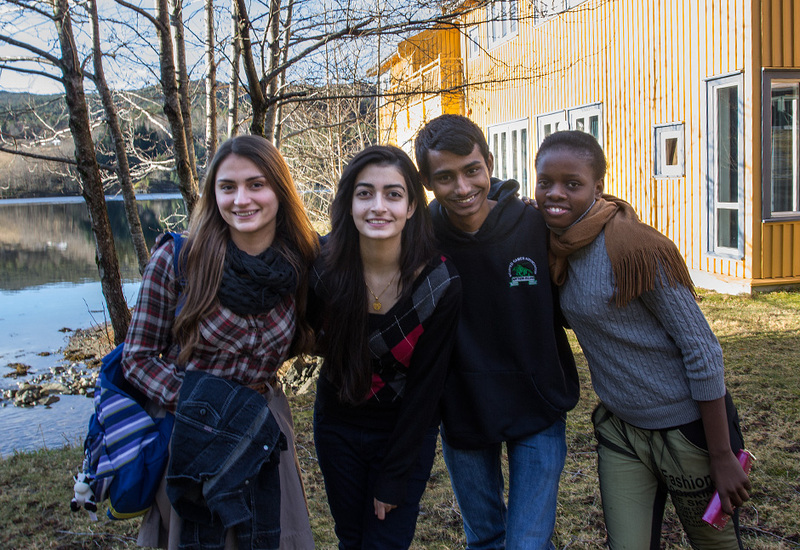 They were supposed to join us at the start of the fall term, but visa issues prevented them from reaching Norway before the Winter Break, so they were invited to begin a foundation term in January. This will give them a firm grounding in the College practices and people before they begin their first year officially in August, 2014. They have faced special challenges as they have been catapulted into a completely foreign, but friendly and supportive environment, arriving at a time when friendships and routines were well-established, the winter darkness was at its peak. Here are a few of their first impressions and experiences. Desiree. Just arrived – and her first snow! Desiree has studied quite a bit of English, but is getting used to actively using the language in daily life for the first time. She hopes that gaining confidence this term will make her future IB studies easier. It will! Shortly after she reached Flekke, she touched snow for the first time, and she has very much enjoyed her first experiences in the Haugland swimming pool, on the gammaldans floor, the badminton court and in TSK. Gautham was “totally homesick” at first, but his compatriots reassured him that time would pass quickly, advised him on subjects, and fed him home-cooked dishes, which lifted his spirits. He has thrown himself into new experiences, joining a trip to the mottak to visit asylum seekers and demonstrating considerable talent in gammaldans. He was also awestruck by the snowfall which greeted him on the journey from Bergen to Flekke. Festina comes from a city environment, and like Nimra, was unaccustomed to walking alone, particularly at night. She is adjusting to the quiet, missing the noise and hubbub of her home, but enjoying the natural beauty of her new surroundings. “If I ever feel homesick, I go for a walk and feel better.” When asked about things she has experienced for the first time since coming here, her immediate response was “instant noodles”! She was also surprised to be invited into teachers’ homes and is enjoying working in science labs for the first time, learning through practical experiments. Nimra is poetic in her recounting of first impressions, commenting on the moonlight reflections on the fjord under the stars. She and Festina meet every evening to share experiences and talk about the many new experiences they are having – and once even to sing, looking out over the water, in English and then in their own languages. Although she feels somewhat overwhelmed by the newness of everything, she explains that at the same time she feels deeply connected to her own culture, appreciating the strong and constant foundation that she has in her family. With the arrival of these four new students, our family is complete! The diggers have started work! We are delighted to report that the building work for our new Centre for Visitors, UWC Connect, has started. The digger has already made substantial changes to the terrain on the south side of Iceland and Sweden Houses. Over the past week, the tranquility of the campus here at RCN has been occasionally interrupted with controlled explosions as the workmen have levelled out the rock formations in the building area. Some of our teachers involved in climbing are delighted to see how the work done has created a new arena for bouldering, as new rocky challenges have been uncovered. The Centre will be used for Leirskule visitors and Red Cross Summer Camps and gives us completely new possibilities to welcome other visitors as part of our task to use education as a uniting force. We hope that the first building will be ready to receive visitors in Spring 2015. We are also looking to expand our summer programme with camps for Roma students from Hungary, UWC short courses, and differently-abled students sponsored by the Norwegian Lions’ Club. Our patron, Her Majesty Queen Sonja will be visiting the College at the beginning of April and will be laying the foundation stone. [Ged Pornthip from Thailand and Andrew Nkumbi from Tanzania], and our two committed teachers Ashok and Madhulika Singh with their family. 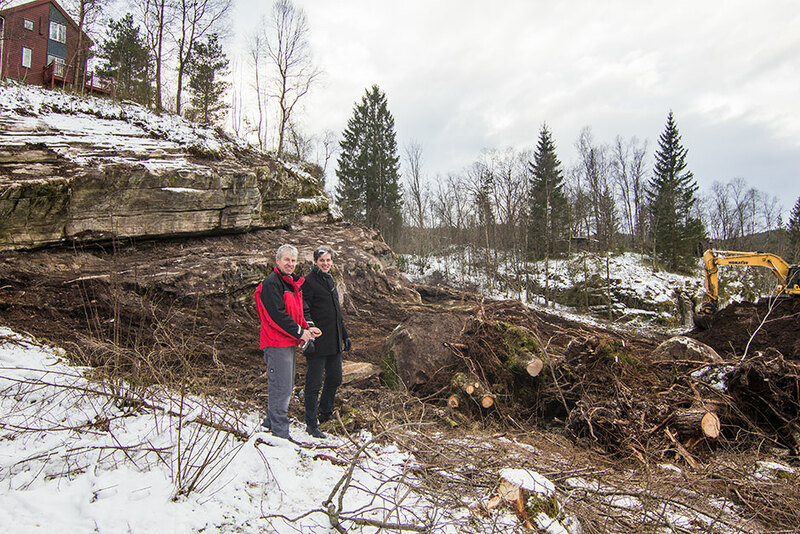 Ashok and Madhulika led us all into not only an in-depth Nordic experience but also to a rewarding understanding of Western European societies. 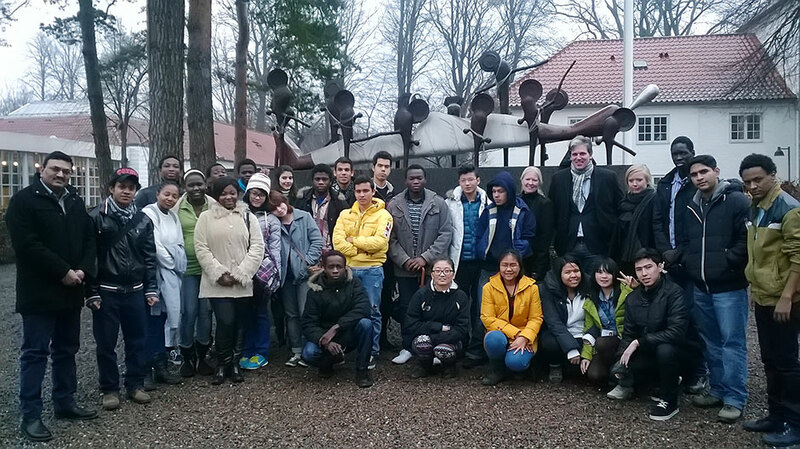 Before setting off to Maastricht the group participated in the official opening of the Dalsfjord Bridge in Dale, and were treated to dinner at Rektor Larry’s House as well as a visit to Oslo and Copenhagen. At the all-new UWC campus in Maastricht, Senior House Mentor Satyadeep Srivastava was waiting for us with some of his students. Rektor Peter Howe, in his welcome speech, simply reassured us all by saying “We are one big family” which was wonderful to hear! During our time in Maastricht we enjoyed several activities: exploring the city, doing some Christmas shopping – with little money, riding bikes and taking long walks to places like St. Pietersburg and the City Wall. The whole group had Christmas dinner and our New Year’s celebrations at a McDonalds and a Pizzeria! Most of us went to the Maastricht Bridge to witness the New Year fireworks. Thank you to all who made this special Winter Break possible!